v A forest is an area with a high density of trees. v Of which total forests account for about 31% of the world’s land area. v In India, the forest cover is roughly 19% of the total land area. v The forest ecosystems are of great concern from the environmental point of view. Ø Reclaiming degraded land & many more…. 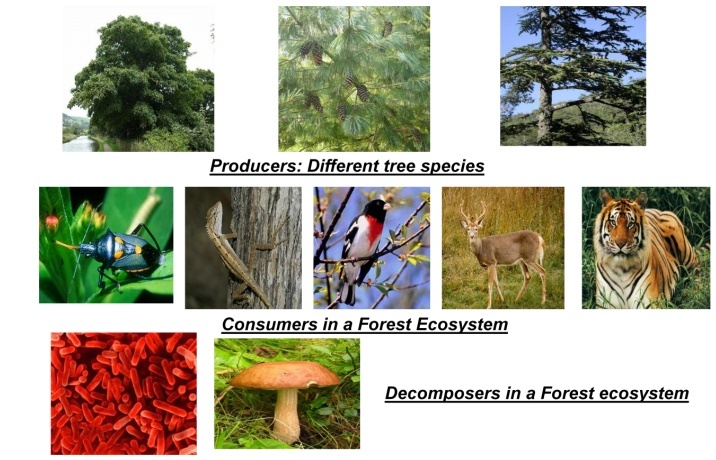 v Apart from environmental values, forest ecosystems have some traditional values as well. Ø Fire Wood & Timber. v In a forest, the producers are mainly trees. v Trees are of different kinds depending upon the type of forest developed in that climate. v Apart from trees, climbers, epiphytes, shrubs and ground vegetation. v Tectona grandis, Acer, Betula, Picea, Pine, Cedrus. v These are Herbivores which feed directly on producers. v Ants, Beetles, Bugs, spiders etc. feeding on tree leaves. v Larger animals such as Elephants, Deer, giraffe etc. grazing on shoots and/or fruits of trees. v These are carnivores and feed on primary consumers. Eg: Birds, Lizards, Frogs, Snakes and Foxes. v These include top carnivores like Lion, Tiger. v Bacteria (Bacillus Sp., Clostridium sp., pseudomonas. v Fungi (Aspergillus sp., Ganoderma sp., Fusarium. v They attract the dead or decayed bodies of organisms & thus decomposition takes place. v Therefore, nutrients are released for reuse. v These include basic inorganic & organic compounds present in the soil & atmosphere. v In addition dead organic debris is also found littered in forests.